We all know that a workshop is not quite complete without a reliable vise to assist with all those jobs that require a third hand. However, it can often prove to be a real challenge when it comes to selecting a new vise. The most important aspect of such a decision is to identify the reason in the first place, whether it be for lightweight soldering projects or heavy metalworking. If you are looking to work a fair bit on heavy parts, you are ideally going to need to purchase a vise that has a pretty decent clamping capacity and can take some serious abuse. We have found the perfect vise for such occasions, and that tool is the Irwin 6 Inch Heavy Duty Workshop Vise. Irwin Tools has been around for over a century, manufacturing tools and accessories that offer superior performance and durability to professional tradesmen around the world! They have a long standing reputation of quality. This much exposure and experience is why we opted to review their Heavy Duty Workshop Vise. The Irwin Tools 6 Inch Heavy Duty comes equipped with fixed main jaws with a width of 6 inches, which provides ample surface contact with objects and ensures stable part fixturing. The jaws provide a clamping range of 0-8 ¾”, which is far greater than your ordinary vise, and is definitely more than enough for most of your clamping needs. The throat depth is 4 ¼” which makes the Irwin the perfect contraption for managing parts with some depth. One feature that we would have liked to have seen is the presence of pipe jaws for gripping round objects but you will only get this if you step up the multi-purpose 5” model assuming you can tolerate the smaller jaws. The Irwin adopts a covered screw design (which we prefer to an open design), which means that the sliding operation of the vise will leave no internal components exposed, thus reducing contamination wear and increasing durability. The central screw is controlled by a stainless steel handle, which when rotated will provide the vise with a clamping pressure of up to 3000 pounds! The Irwin, like most bench vises, comes fitted with a smooth flat anvil, that can withstand a good beating, making it the perfect workstation for hammering and bending the parts you are working on. It’s not huge, but it’s not small either. It’s big enough to get most basic jobs done. The base of the Irwin workshop vise comes with four lugs, allowing you to securely mount the device to any workbench with nothing more than a drill and some bolts/nuts. In addition to that, the base does also swivel, making it easier to position parts for clamping without any added headache. The base can be locked into place by locking pins which are positioned on either side. The Irwin Tools 6 Inch has been manufactured using high quality grey iron, giving it good strength and durability. To top it up, the oceanic blue coating gives the vise not only that soothing appeal but also protects it from rusting, which can often be a problem for many vises. We find the fit and finish to be decent, if not above average. The construction itself is quite nice though, which is indicative of a long lasting vise. 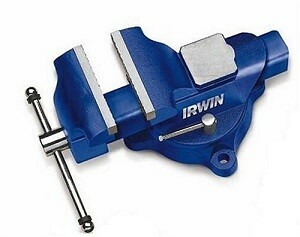 The Irwin is lingering in the mid price range for workshop vises of this kind. Considering that they are built with good quality overall, they can be considered reasonably good value for your dollar. If you shop around, you will find that you can grab the Irwin inexpensively from Amazon due to the competitive pricing. Overall, if your work involves the handling of a wide range of heavy material, we recommend you consider the Irwin Tools 6 Inch Heavy Duty Workshop Vise, which will give you good quality for a good price!